What can I do at my home to be Green and Eco-friendly? The Home Energy Saver (HES) empowers homeowners and renters to save money, live better, and help the earth by reducing energy use in their homes. HES recommends energy-saving upgrades that are appropriate to the home and make sense for the home's climate and local energy prices. The money invested in these upgrades commonly earns "interest" in the form of energy bill savings, at an annual rate of 20% or more. HES also estimates the home's carbon footprint and shows how much it can be reduced. 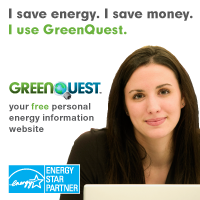 How can I compare my home's energy efficiency to similar homes across the country? If you have five minutes and your last 12 months of utility bills, use the ENERGY STAR Home Energy Yardstick (link below) to compare your home's energy efficiency to similar homes across the country and get recommendations for energy-saving home improvements from ENERGY STAR. You will also need to enter some basic information about your home (such as zip code, age, square footage, and number of occupants). If you don't have your bills, contact your utility for a 12-month summary. How do I select a Compact Fluorescent Lamp? According to ENERGY STAR, if every American home replaced just one light bulb with an ENERGY STAR qualified bulb, we would save enough energy to light more than 3 million homes for a year, more than $600 million in annual energy costs, and prevent greenhouse gases equivalent to the emissions of more than 800,000 cars. 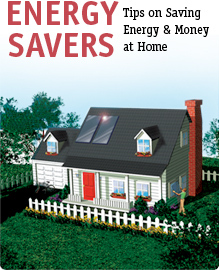 Energy Savers provides homeowners with tips for saving energy and money at home and on the road. By following just a few of the simple tips found on this Energy Savers Web site, you can make your home more comfortable and easier to heat and cool—while you save money. 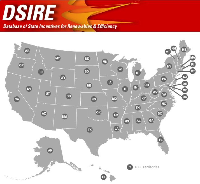 SOLAR-ESTIMATE.ORG is a free, public service. They believe that the efficient use of energy and renewable energy systems makes for comfortable living and a more secure future. So they want to help you reduce your energy demands, increase your energy efficiency and help you utilize more energy from renewable energy systems and sources -- like solar electric (PV - photovoltaics), solar space (air), water & pool heating, wind turbines, biomass furnaces and ground-source heat pumps. Their mission is to serve as a convenient, user-friendly means for home and small commercial building owners to make preliminary evaluations of renewable and solar energy options for their location, run financial analysis and help find and verify the experience, quality and business status of certified solar contractors, and other professionals who can design, install and service renewable and solar energy and energy efficient power systems. 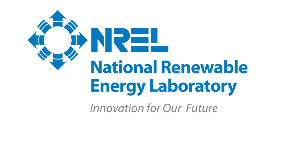 NREL is the only federal laboratory dedicated to the research, development, commercialization and deployment of renewable energy and energy efficiency technologies. Backed by 32 years of achievement, NREL leads the way in helping meet the growing demand for clean energy.